Each of the 16 outputs can be connected through a resistor and then through an LED to serve as a simple 16 LED controller. The LED can be chosen at random by the status of the 4 line selector inputs. 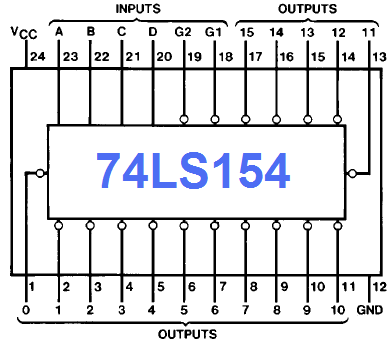 However, due to the internal structure of the 74154, only one output can be enabled at a time. This chip is often used in demultiplexing applications, such as digital clocks, LED matrices, and other graphical outputs. 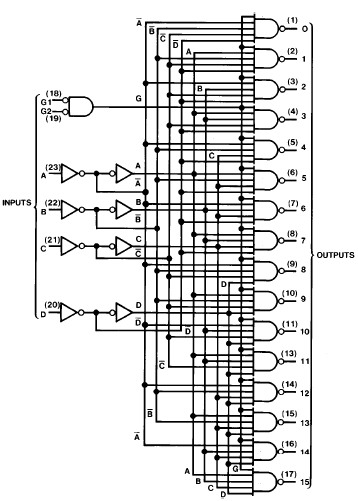 For example, if the target application requires 16 7-segment LED displays, but your microcontroller only has 4 lines to select which display is active, this chip (74LS154) would provide a very effective method of essentially multiplying you selecting lines by a 4 times. Understand, this is a typical example of application, not it's sole purpose. 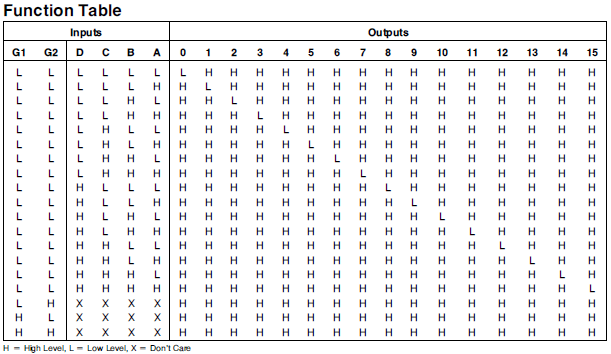 Download the datasheet below for a more comprehensive summary. transmission-line effects and thereby simplify system design.